African Lion Safari, Hamilton, Ontario. Information, Photos and Reviews. Get CLOSER than you ever imagined to over 1,000 exotic birds and animals that roam freely throughout seven large drive through Game Reserves. After your “safari” through the Game Reserves, set out on a walking tour of the grounds and enjoy exciting bird and animal presentations featuring Parrot Paradise, Birds of Prey Flying Demonstration and Elephants & Friends. Kids can monkey around in Jungle Playground areas then cool off in Misumu Bay Wet Play (seasonal). This interactive water adventure zone lets kids stroll through sprinklers, spouts and stream jets, trek under rain trees and tumble buckets, and interact with gadgets, gizmos and geysers! Splish and Splash in Misumu Bay Wet Play! Drive through large Game Reserves in your own vehicle! Nobody has reviewed African Lion Safari yet, Be the first. You are submitting a booking enquiry. 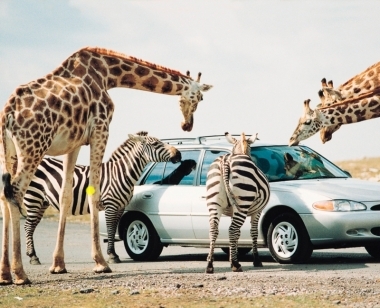 African Lion Safari will then contact you by email with details of availability and prices.